Where to Live in Atlanta: City or Suburbs? So you’ve taken the plunge, packed your bags and are headed to Atlanta, but the million dollar question remains: Where will you live? Atlanta is such a sprawling city, and one that’s infamous for its traffic and long commutes, so many people choose to live in a neighborhood near their office. Of course, there are other important factors to consider, from cost of living and access to public transportation to the quality of the schools. Lifestyle plays a big part in deciding where to settle down. Those seeking a true in town experience may want to buy a condo in Midtown or a townhouse in Inman Park, whereas families looking for a big house with a yard on a quiet street may prefer a suburb, like Roswell or Smyrna. To wit, here's the essential neighborhood guide to Atlanta to help you decide which is right for you. Take a look. Those living ITP often live a faster paced, urban lifestyle complete with pedestrian-friendly neighborhoods, access to public transportation, shorter commutes, a plethora of cultural attractions, and world-class dining and shopping. On the flipside, those living OTP often find a relatively lower cost of living (more house for the money) alongside communities with amenities like swimming pools and tennis courts and stellar public school systems. Atlanta is a city of micro-neighborhoods — with 242 neighborhoods officially defined by the city, it can be overwhelming to decide where to live. Downtown: Encompasses the following neighborhoods: Castleberry Hill, Five Points, Luckie Marietta, and Peachtree Center, among others. Midtown: Encompasses the following neighborhoods: Peachtree Street, Historic Midtown, Atlantic Station, Home Park, Georgia Tech and Technology Square, Loring Heights, and Sherwood Forest, among others. Buckhead: Covers the entire northern fifth of the city (north of I-75 and I-85) and encompasses the following neighborhoods: Chastain Park, Collier Hills/Brookwood Hills, Garden Hills, Lindbergh, West Paces Ferry/Northside, Peachtree Hills, Tuxedo Park, and Peachtree Battle, among others. East Side: Popular neighborhoods here include Cabbagetown, Edgewood, East Lake, Inman Park, Grant Park, Kirkwood, Old Fourth Ward, and Virginia-Highland. West Midtown: Popular neighborhoods here include Berkeley Park, Western Home Park, Knight Park/Howell Station, and Marietta Street Artery. The Atlanta metro area is home to dozens of suburban neighborhoods. 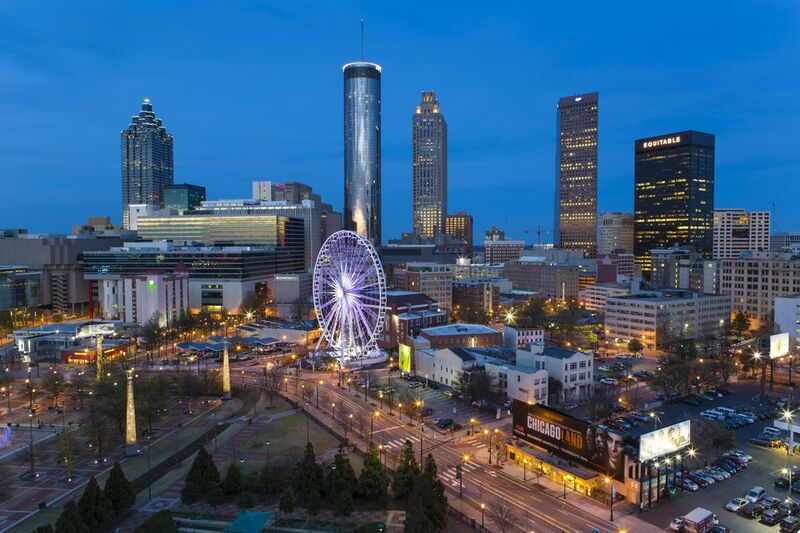 Some of the popular suburbs include Chamblee, Dunwoody/Sandy Springs, Smyrna, Alpharetta, Roswell, Marietta, Kennesaw, Norcross, Duluth, John’s Creek, and Stone Mountain. Though the suburbs are quite a ways behind the city in terms of cultural attractions and trendy restaurants, there are some neighborhoods (namely Alpharetta’s Avalon and Roswell Square) that have expanded their offerings beyond your basic chain restaurants and into charming, independently owned spots worth many return visits. Personal preference will be the biggest indicator of which neighborhood is best for you. For some objective advice, real estate expert Svenja Gudell, senior director of economic research for Zillow, helps to understand the financials of living in town versus the suburbs. So what does this all mean? “Essentially, it’s more expensive to buy in the suburbs, but you’re probably getting a larger house with a bigger yard on a more private street,” explains Gudell. So you’ll spend more money outright (column 1), but you’ll get more house for your money (column 2). Living in town is currently a better financial investment than living in the suburbs of Atlanta, but you’ll get more house for your money in the suburbs. However, money isn't the end all be all when it comes to finding your perfect neighborhood. "Spend time in any area you're considering living in," advises Josh Green, the editor for Curbed Atlanta. "And that doesn't just mean having lunch there on the weekends. Investigate what the traffic patterns are, how active the community is. Go there in the morning, and at night. Pay attention to home-listing services in the area. See what the sales trends are. If you see a large number of homes or apartments being built, or older houses being refurbished, it's a pretty good indicator of strong desirability. If you see no construction activity in an Atlanta neighborhood right now, that's probably a sign that its matured, or a red flag that something's not quite right."